The first time I went to the Joyce Kilmer Memorial Forest—a 3,800-acre tract— I was awe of the concentration of old growth trees along the 2-mile trail takes you through one of the last remaining virgin cove forests in the Southeast. Here grow behemoth yellow poplar, oak, basswood, beech and sycamore, some believed to be more than 400 years old. Put in perspective, some might have been saplings when Hernando De Soto and the first Europeans passed through. The massive canopy limits the amount of plant life below—thought it does make room for an impressive spring wildflower display of cohosh, trillium, crested iris and more—giving the forest an ethereal feel. But just across Little Santeetlah Creek— outside the memorial forest but within the Joyce Kilmer-Slickrock Wilderness— hikers can find true wonders. From the shared parking area, follow the Naked Ground Trail up Little Santeetlah, through a long draw that culminates in something approaching a box canyon. Along the way, you may glance up on occasion to take in these more subdued hardwoods and then — Whoa! look at the size of that tree! For whatever reason, the Babcock Lumber Company working the area a century back missed a few prime specimens: some giants are more than 100 feet high and more than 20 feet around. Occasionally, you’ll see a handful in close proximity. It’s a fine reward for a walk in the woods. Below, you’ll find some of the remaining stands of old growth forest in North Carolina and Virginia. Additional information on exploring each area can be found below. According to the Southern Appalachian Forest Coalition, there was no logging here above 3,680 feet, leaving impressive montane-oak hickory and high elevation red oak forests. Protected as “Large Parch Old-Growth” by the Nantahala National Forest, trees here date back more than 200 years. Head down the Moccasin Trail from the park office and you’ll quickly be surrounded by some of the largest existing trees of their kind. Bay trees, sweet gums, persimmons and pawpaws all reach heights you’ve not seen before; bald cypress with trunks 10 feet in diameter and poplars reaching 130 feet are not uncommon, as are 100-foot-high Atlantic white cedars. This trail begins below 1,800 feet in elevation, and within a mile and a half reaches the 3,200-foot mark, above which no logging took place (overall elevation gain on this 3.9-mile trail is just under 3,000 feet). Look for chestnut oak, black gum, red maple, black birch, table mountain pine, and Carolina hemlock, if you can see them through the mountain laurel and rhododendron lining the lower portions of the trail. Find more info on Snook’s Nose and our weekend visit in May below. There was a time when longleaf pine was the dominant forest in the Southeast. Today, the full majesty of this tree once coveted for its resin and sturdy trunks used as ship masts can only be found in places such as Weymouth Woods, where the longleaf still reaches heights of 100 to 120 feet. The oldest trees — up to 450 years old — can be found on the preserve’s Boyd Tract. It took a train wreck that bankrupted the local lumber company in 1910 to spare portions of the North Creek watershed from logging. This trail combines with the AT for a 7-mile loop hike. Garden Mountain is part of the Ridge and Valley Province, and the surrounding forests include old-growth upland oaks. You’ll also get good views from atop Garden Mountain and Chestnut Knob. Explore old growth with GetHiking! On our GetHiking! Classic Escape in May, we will explore old-growth forests in the Pisgah National Forest. 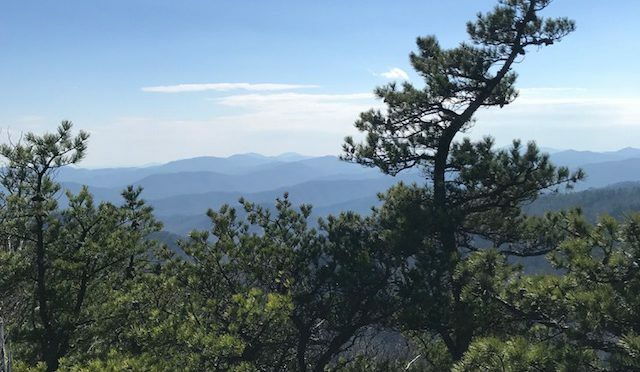 On Saturday, May 19, we’ll climb the challenging 3.9-mile trail, going over Snook’s Nose and Laurel Knob, and search for old-growth forests above 3,200 feet. On Sunday, May 20, we’ll explore more old-growth in a shorter hike that’s more off-trail. Both hikes originate from our base camp for the weekend, the Curtis Creek Campground. Learn more about our May escape and sign up here. “Ancient Appalachian: the Southeast’s Old-Growth Forests” appeared in Blue Ridge Outdoors in 2005 and provides a look into the extent and location of old growth forests in the Southeast. Read the story here. Directions: From the town of Andrews, take Junaluska Road to Junaluska Gap and park. Hike northeast on the Junaluska Gap Trail for a little more than a mile, then head northwest (or go left) on Hickory Branch. (You can return via the London Bald Trail).